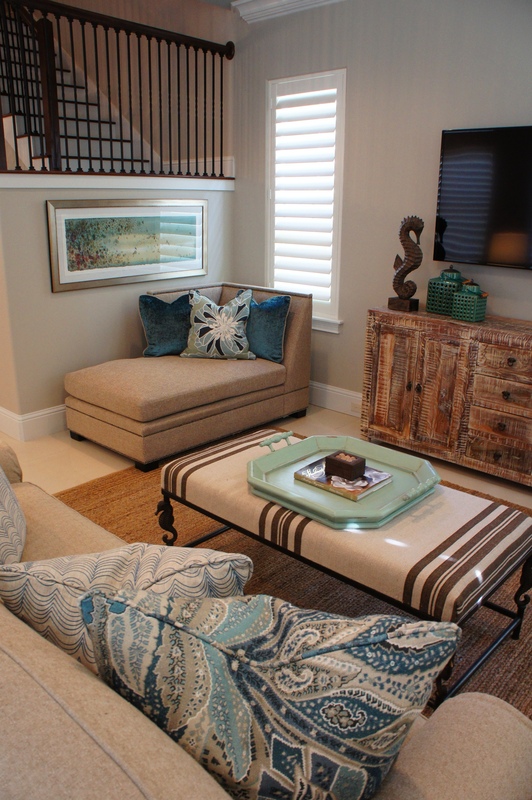 This design is the result of combining traditional, casual, coastal, refined and rustic elements together. The house is located right on the 5th hole of the Baytowne Golf Course. While this presents a beautiful green yard and view, We had a privacy issue to address. 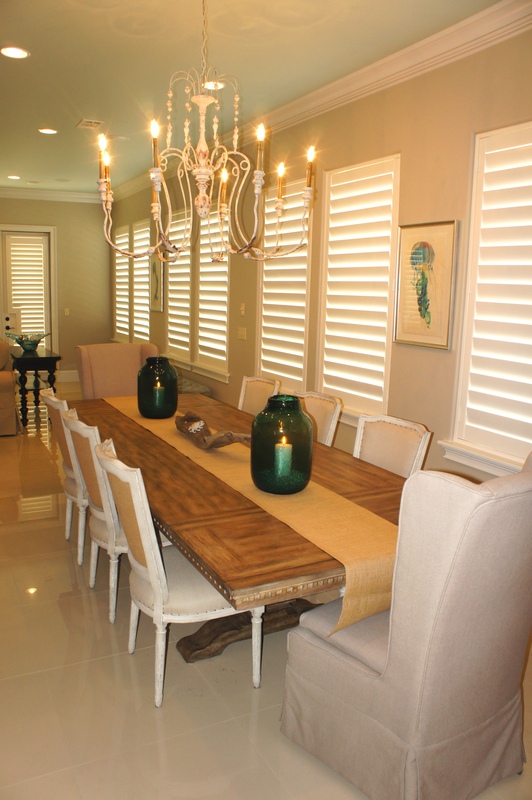 Shutters are great for this, as they are clean, open, and architectural. 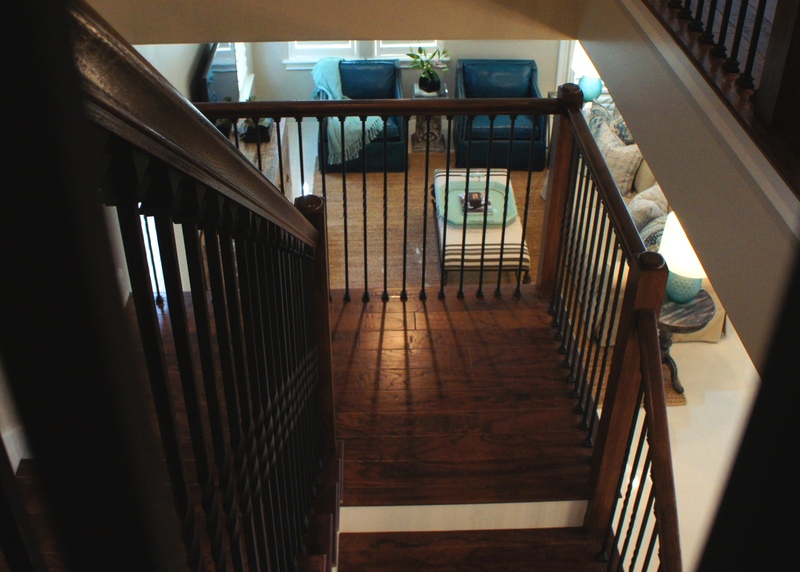 The wider the slat, the more view you maintain when opened. When closed, you have complete privacy. 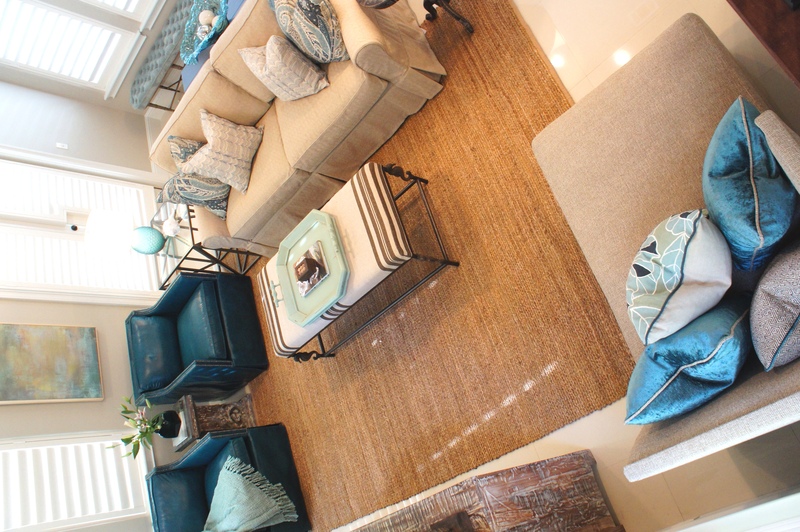 Let us start with the Living Room! I designed the color scheme around the printed sofa pillows! 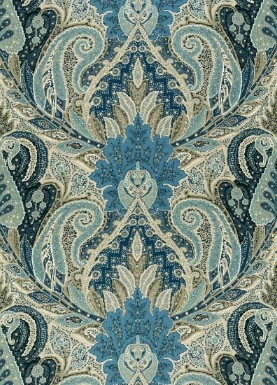 This Schumacher fabric had a gorgeous blend of blues and greens! 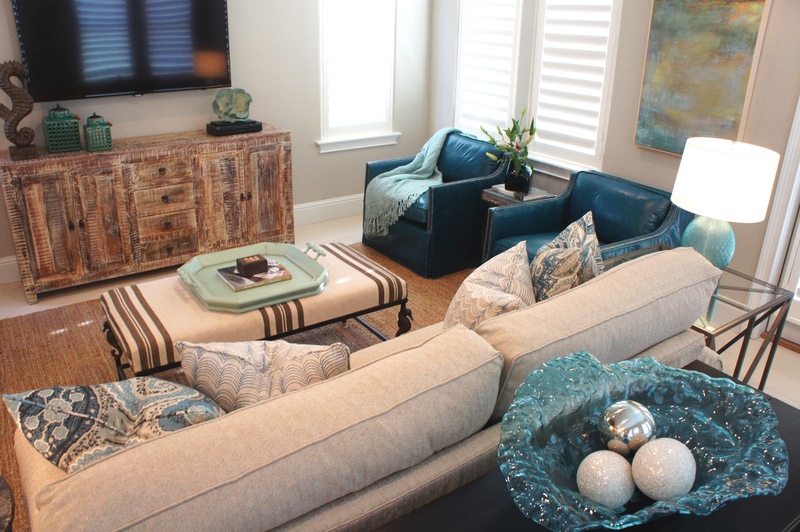 Instead of having just one accent color in the room, it allowed me to have a beautiful mixture of seafoam, peacock blue, teal, and other greens. 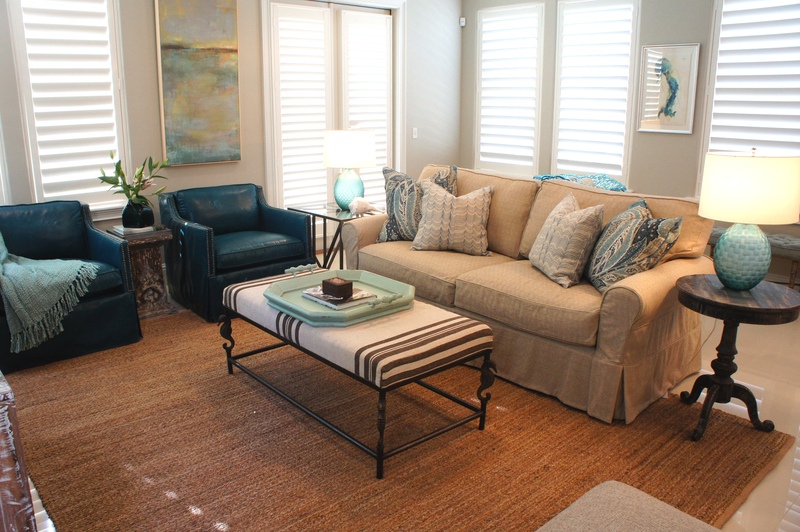 I chose an L-shaped furniture arrangement: slipcovered sleeper sofa with two club chairs. To balance that arrangement, I placed a chaise lounge in the opposite corner. 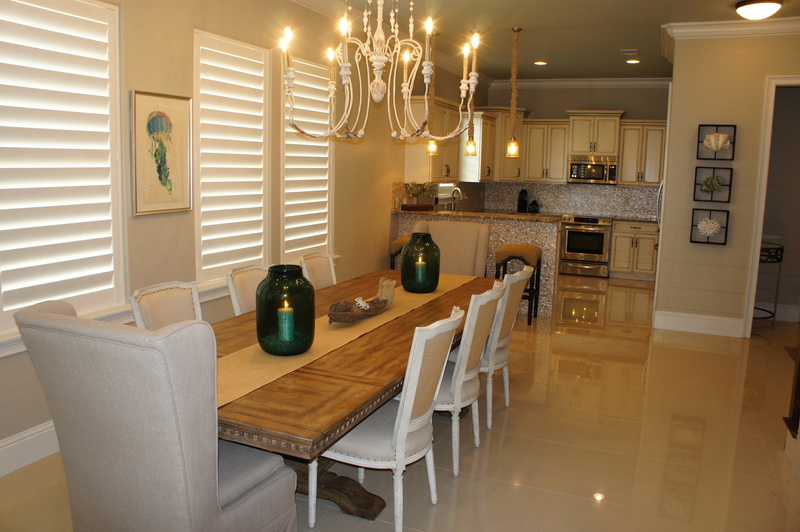 The cocktail table is upholstered in a textured brown stripe and has iron seahorse legs. I love this piece by Design Legacy! 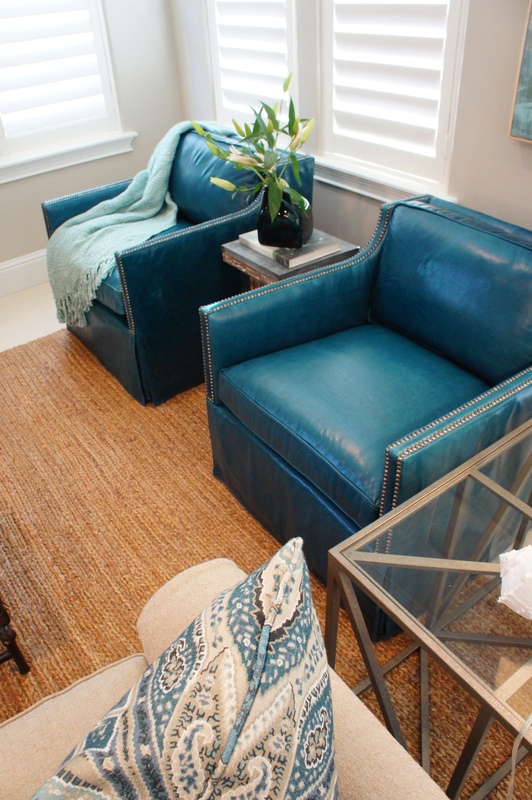 The star of the room, by far, is the pair of blue leather club chairs! Typically, when you think of a leather club chair, you think of something upholstered with nailheads and no skirt. A cool trend now is to do more of a draped leather look, with tailored shirts. This makes the chairs slightly less masculine and heavy. In the corner, just below the stair railing, there was the perfect opportunity to do a chaise lounge. It used the space wisely, while also providing a comfortable place to lounge, read a book, take a nap, or join in converstation. 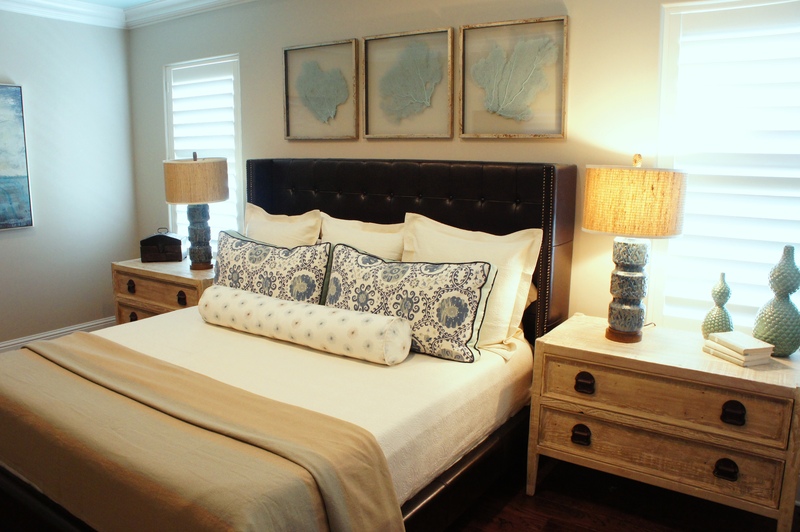 Bed by Four Hands, Bedside Chests by Noir Furniture. This is the Master Bedroom. I used a leather wing bed as the anchor for the room. The bronze handles on the bedside chests tie the dark leather in, while the antique white finish lightens the feel up some and adds a coastal flair. 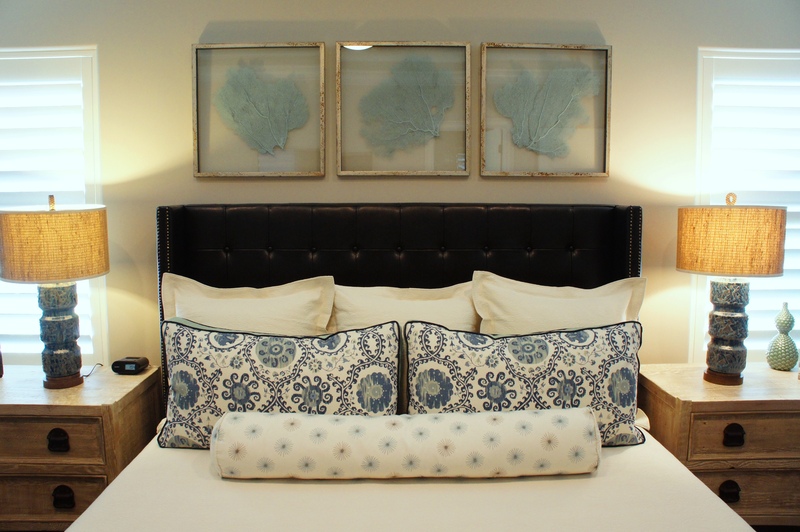 The art above the bed are custom framed seafans that have been painted a soft blue green that blends nicely with the bedding fabrics. This is the little boy’s room! 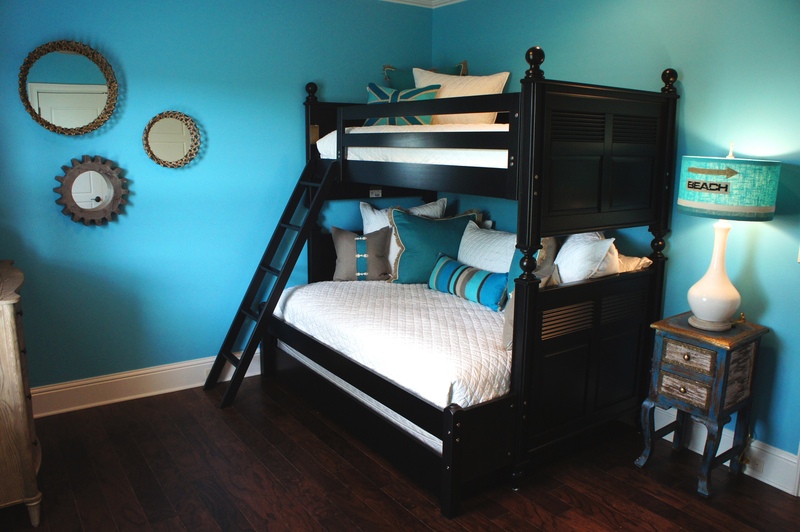 This little boy wanted a bunk bed (it’s funny how kids love the idea of bunk beds, while we cringe at the thought of having to make them!). Anyway, this room provided me the opportunity to do something bright and fun! I typically strongly suggest choosing a wall color that has more of a gray undertone, making it less saturated, as colors always become more vibrant when you paint them on a large scale. In this case, I opted for a more saturated blue. The black and white of the bed and bedding, along with the wall mirrors and other furniture provide visual rests from the vibrancy, for the perfect balance! 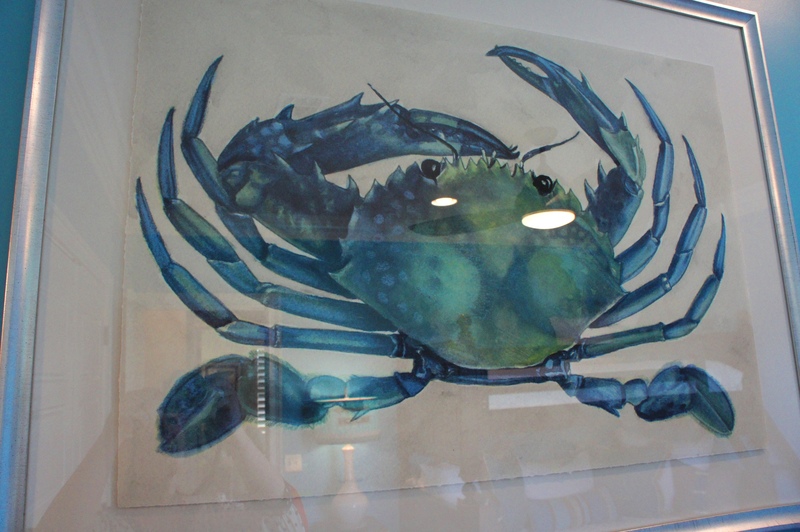 This crab painting is on a wall opposite from the bed and could not be in the main shot, but I had to include it so you could see the colors! They are brilliant, and go so well with the bedding and room! This is the guest bedroom. 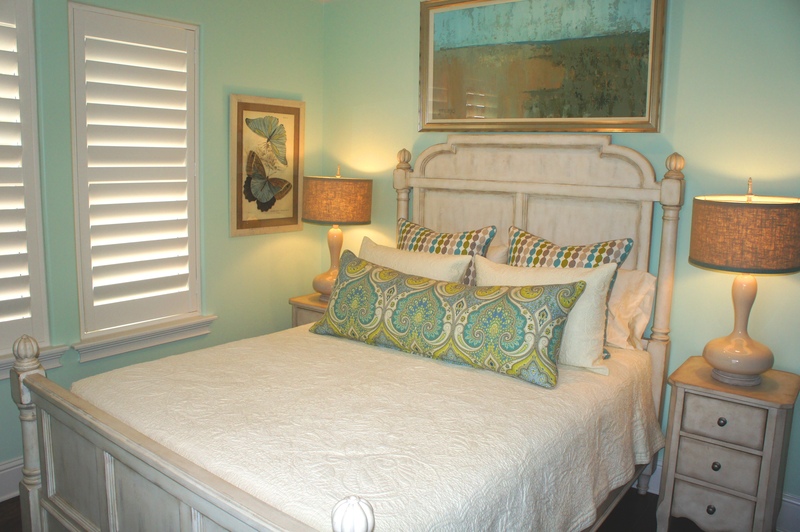 I went for a softer minty green color for the walls, and utilized an array of different blues and greens in the bedding. This room has a nice “cottage” feel. Please check out my other posts, and contact me if you need any design help!